One month after a Florida newspaper called its gun show ad placement over murder coverage a "regrettable coincidence," Charleston's Post and Courier has trotted out the exact same excuse for a similar judgment error. 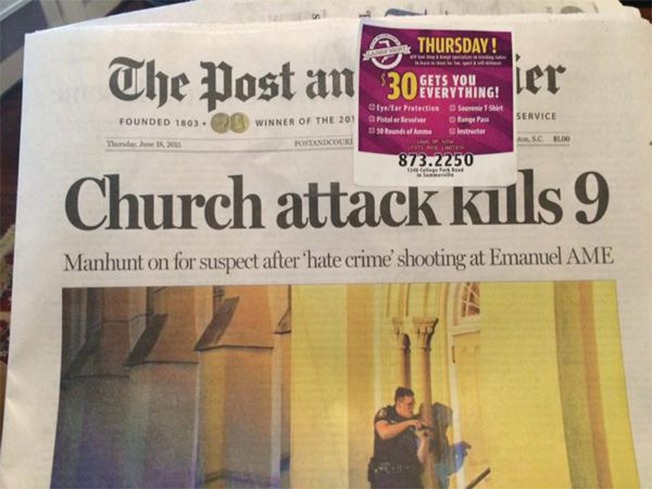 In today's example, the South Carolina newspaper ran a sticky-note ad for a gun store over its coverage of Wednesday's horrific killings of nine church-goers at Charleston's Emanuel African Methodist Episcopal Church. "The front-page sticky note that was attached to some home delivery newspapers on the same day as this tragedy is a deeply regrettable coincidence," the paper told a Facebook commenter, according to Poynter. "We apologize to those who were offended." These apologies (especially those that seem quite literally copied and pasted from previous instances of ridiculous ad placement) do little to appease critics and, if anything, highlight the newspaper industry's repeated inability to show common sense when it comes to ads that are 100 percent guaranteed by their very nature to appear over high-profile news stories. While it surely wasn't an intentional act of malice, these errant ad placements are clearly avoidable and even predictable. They're absolutely bound to happen, and preventing these gaffes should be a daily aspect of putting out a responsible newspaper.